Every year, it’s the same story. I swear, it feels like reporters have a file they send to each other every March where the headline hardly changes, and the words in the story get switched around just enough to give it the appearance of something fresh. They all go something like this, “ . . . employers lose billions of dollars during tourney . . . employee output takes huge dive in March . 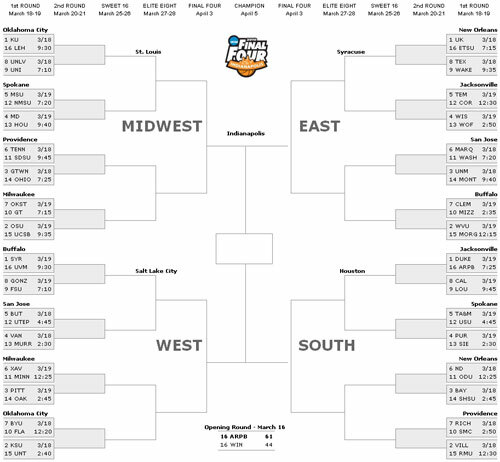 . . workers argue brackets bring a high sense of morale in a challenging work environment . . .” You get the picture. A recent story on CNN says that during the first week of the tournament, employees will spend twenty minutes a day on the internet checking scores. Twenty minutes? What about last week when employees were spending that much time on Facebook or Twitter? The reason March is so much fun is because you aren’t at your desk trying to hide the fact you are on ESPN, Facebook or the Upper Deck Blog. You can openly have your browser updating basketball scores every thirty seconds. Everyone is on the same page. Last year, I entered four brackets into two different pools. I paid my dues and made my picks. With each bracket I took a different approach to filling it out. I tried to cover every picking method out there. Here are the ones I used, and in the end not one of them paid off. I am interested in what you do; as a warning, if you try my methods there are no guarantees. 1. The “I Like Their Colors” Picks: This one is reserved for those who don’t follow college ball during the regular season. I hate to say the following statement because it sounds so cliché, but it is the truth. This is the method most women, but not all women use (my wife included). At her last employer, my wife won their bracket challenge beating out all guys; even the office sports guru who knows these players’ stats from their pick-up games at the park. I asked her how she did it and why she picked the winner. Simply stated it, was because they had nice colors. Her whole bracket was based on the school colors. That’s it. No analysis. Not a single game watched. Just the colors. I think five of my teams actually made it to the next round because I liked their colors. 2. Follow the Analyst Method: Many of us would love to be paid to sit around and talk about sports all day. We put a lot of faith in the words of a guy who might have used to play a long time ago so we decide their words are gospel. They sound so smart giving in depth analysis on each team, each bracket, each ranking and so on. How could they be wrong? We don’t even take into account the stat guys backstage with their computers furiously trying to find all of this information. Granted they do have years of experience watching games and doing what they do. They are great at keeping us up to date and informed. No way would they lead you astray. Those who use this method pick up USA Today on the way to work and follow whatever the majority rule might be from the talking heads. 3. Cinderella Method: This method is extremely popular and used in some form in almost all brackets. We love to see a Cinderella team win against the big guns. These are the teams like number 16 Vermont beating first ranked Syracuse, and then pounding their way into the Final Four. These picks are always a toss-up, but when you get it right you feel so good. Next time at the water cooler it’s your turn to pound your chest and gloat. When you get them wrong (more likely to happen), your whole bracket is trashed and your final games looks foolish because you have Kansas playing Robert Morris for the title. Be careful going down this road. It is okay to pick a Cinderella, but don’t have them going too far, and don’t pick too many. 4. Blind Pick Method: By far the easiest method of them all and potentially the biggest pay off. Grab your bracket. Don’t look at anything else. Not your paper, the internet, your friend’s bracket or your wife’s color picks. Start at the top left and work down. Make sure to read each team and ranking out loud. Take about five seconds to process how each sounds rolling off the tongue, I like to close my eyes during this step, and then pick the one that sounds best. Repeat the process until your bracket is full. For this to work you cannot go back and make any changes at all. Your pen has iron ink and cannot be erased. This is a TOTAL shot in the dark, but the feeling of collecting your prize money will be like none you have ever felt. Suddenly everyone in the office thinks you have psychic powers and you are doing palm readings in the break room charging ten bucks per person. Most likely you will be so far down the list after the first week, you might as well have spent your entry money on a cheeseburger. When I used each of these methods exclusively last year on separate brackets I got hosed. The recovery has been a long process, and I haven’t even had the guts to touch this year’s bracket yet. The bracket that did best was the one where I followed the analysts exclusively. I was high on the list until the Elite Eight, and then things just crumbled. It is also the same round where the sports guys had the most differing opinions. As you participate in “team building” events this week I hope you take a little something from all methods. I think a good mix could actually be very rewarding. May each of you enjoy the Madness in March and do better than I. Please share your methods with the rest of us! It boosts our chances at the money and bragging rights. Logan Millard works and lives in Salt Lake City, Utah. Aside from his full time job, he works for the Utah Jazz as a media relations coordinator on game nights, and also helps Fox Soccer Channel when they are in town.